The changing role of women from the French Revolution at the end of the 18th century through the Regency, Victorian and Edwardian periods at the beginning of the 20th was reflected in fashion. Impractical frivolous costume gave way to a new sense of functionality as women became more active and engaged in business, politics and sport. In addition, monarchical tastes and changes in the political climate triggered dramatic changes in costume, exuberant to conservative and then back to extravagant frivolous fashion. Other developments including the emergence of ready-to-wear clothing, a result of mass manufacture and growth of standardization of clothes for the swelling middle class, greatly influenced fashion through the 19th and into the early 20th centuries. The fashion trend in the late years of the 18th and early 19th centuries was influenced by Classical Greece: high waisted gowns with long thin muslin skirts, heel-less sandals and long stoles. After 1810, skirts gradually became fuller and decorated at the hem with frills and ruchs. Sleeves were short to the elbow or worn long to the wrist often decorated with ribbons. By the 1820s, fashion had changed from flowing Classical style to tightly corseted waists, full sleeves gathered to a fitting cuff, fuller skirts and higher necklines adorned with collars or small capes. Ringlets and curls were worn high on the head. Headwear ranged from straw hats and bonnets to small muslin caps and feather decorated turbans. Cloaks, cashmere shawls, scarves, and muslin draperies continued in use. The spenser (a short waisted jacket), the redingote (a belted, coat with collar and several shoulder capes) and the pelisse (an ankle-length long-sleeved often fur trimmed coat) were popular forms of outwear. 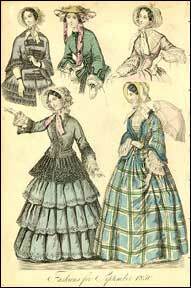 Crinolines made from hoops of whalebone covered with layers of flounced petticoats were introduced in the 1840s-1850s reaching greatest popularity around 1860. Dresses were made from sumptuous materials such as velvet, brocade, taffeta and silk. In 1840s, sleeves were fitted to the wrist, but by the 1850s they were worn wider and shorter, often with a muslin, sometimes puffed, undersleeve. Mantles and taffeta or velvet cloaks were popular along with a variety of shawls. Small bonnets, or poke bonnets, were favored as headwear, although flat brimmed straw hats were worn for informal occasions. Crinolines disappeared in the late 1860s, while bustles emerged in the 1870s. Dress shapes changed--the front and sides were flattened while the bustle or fullness was retained at the back using a horsehair crinoline with whalebone or metal bands. 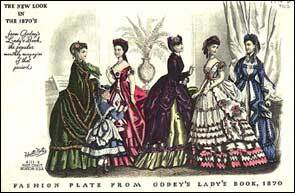 The bustle was worn under petticoats and a gown often looped up in elaborate folds at the back. This style had an accompanying tight fitting front fastening bodice. Necklines varied, changing from a high neckline to a low square neck opening in the 1870s and back to a high line with standing collars that lasted into the first decade of the 20th century. The corset, or day bodice, was used to cinch the figure from shoulder to hip. In the 1880s the princess line (defined by bodice and skirt as one without a waistseam, a full skirt looped up low and back decorated with ribbon bows) was in vogue. Sleeves were close fitting and plain; short puffed sleeves with a low décolletage were worn for eveningwear. Hair was either coiled and looped up on the back of the head or hung down the back sometimes gathered and covered by a net. Hats and bonnets trimmed with ribbons, flowers or feathers were usually small in size, either set forward or flat on top of the head. By 1909, the straighter sheath line silhouette replaced the fuller skirts of the previous century. The restrictively narrow tubular shaped hobble skirt became fashionable in 1910. To prevent women from splitting their skirts, a fetter was sometimes worn or a small slit at the front or side was added. Paul Poiret, a prominent French dress designer, introduced Oriental-influenced fashion. Kimono or Magyar style sleeves, turban headwear, Turkish or harem skirts and tunic overdresses with large armholes, open to hip level, were common. Sports wear, tailored suits, Russian style jumpers and bolero jackets were popular. In 1912, coats with fur or velvet rolled collars or lapels, usually longer in the back, were worn for evening wear.